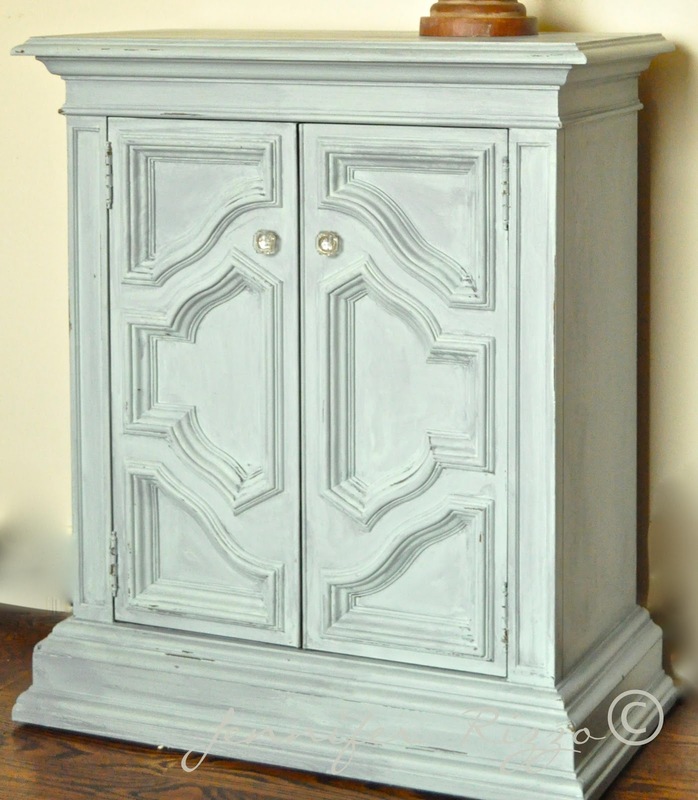 Old,dated cabinet re-painted and made-over with new knob placement and grey-washing!!!!…. Hi everyone!!!! 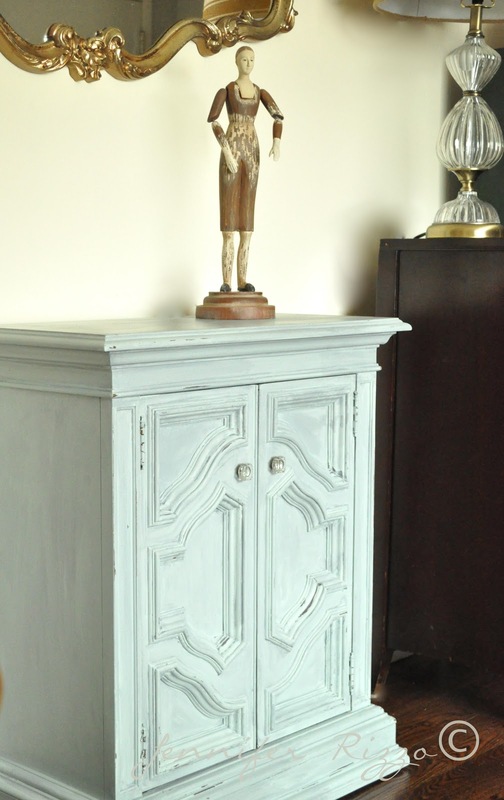 I am so excited to share this cabinet maker over with you! I found this old,dated cabinet at a local thrift store. it’s a good heavy piece of furniture, but it looked really 1970’s Mediterranean. I knew it had a ton of potential it just need to have the knob placement moved and be re-painted something for a more modern take. That dark wood is a light sucker. I also grey-washed it, which is sooo much easier than you think. First I gave it light sanding. I know those of you who use ASCP will argue against this. That’s fine, I learned the old fashioned way, so I always give it a quick once over. 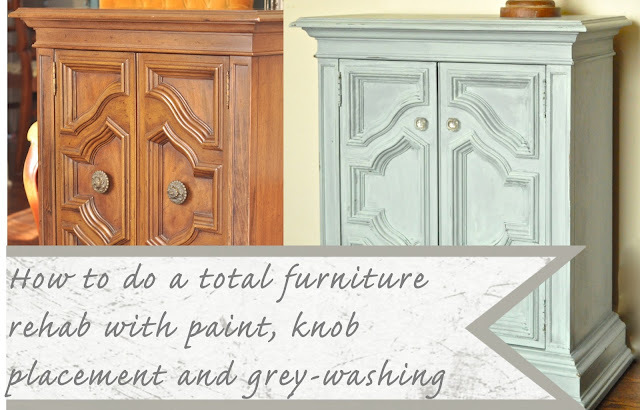 In fact, you can read some answers I have on how to paint furniture here. 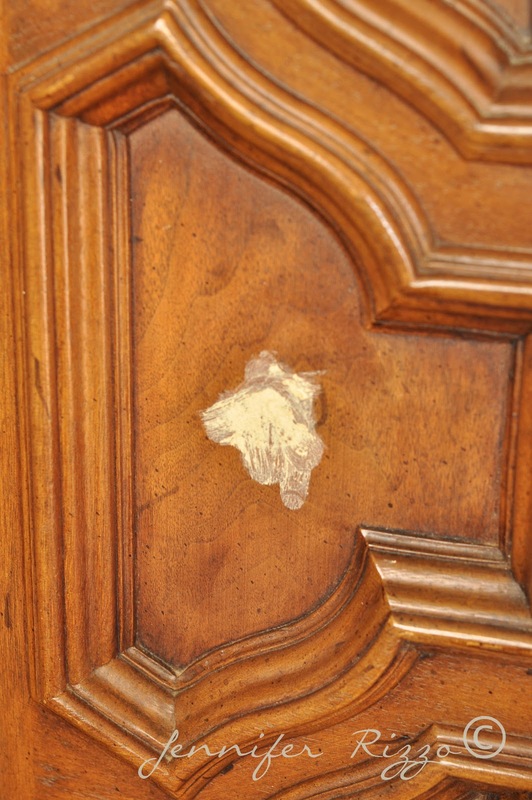 The first thing I did was fill in the old holes with wood putty, let it dry, and if needed refilled them.If you put a piece of painter’s tape in the back of the hole,it keeps the wood putty from squishing out. One your putty is dry, sand the excess off until it’s flat. 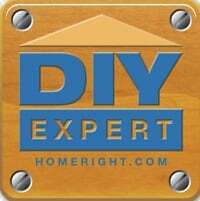 Then re-mark and drill your new knob holes. Once your holes are drilled it’s ready to paint. I like using one of these wet erase chalk markers to mark my holes for drilling, it shows up on dark wood and wipes off super easy if need be. After I did a base coat of a paint with primer in it, or you can use ASCP, I then started grey-washing. Grey-washing is to 2013 that glazing/antiquing was to 2007. It’s the new hip thing and all of the cool kids are doing it. 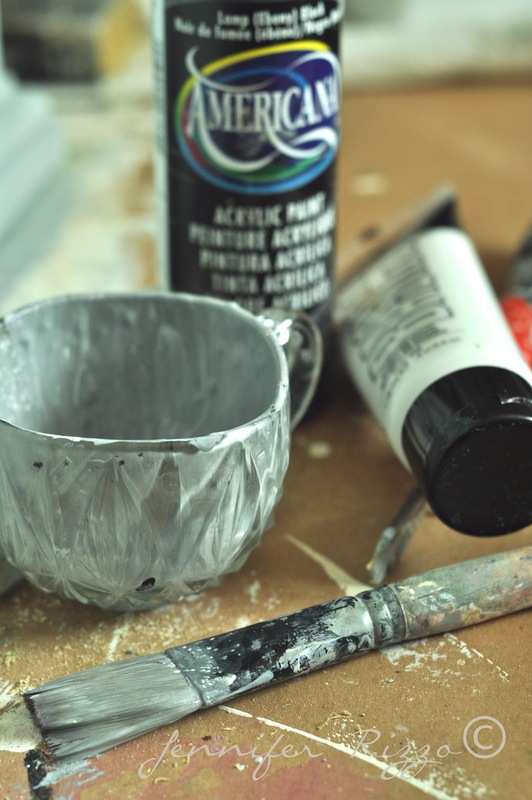 I use a 50/50 mixture of white/black craft/art paint and a touch of water to make it creamy. That’s all. It’s so easy. With a soft brush paint on some of the grey-wash and with a very slightly damp paper towel,kind of rub-in, lift off at the same time. On this piece you can see the difference between the left and the right. It deepens the color and can tone down something a bit bright. Just don’t over work it or you can start lifting paint. I did a slight distressing with my sanding block. When your done, let it dry and then you seal your piece with either a polyacrylic or a furniture wax. In fact, if you want to know which you should use, you can see this post here. It think it makes it looks like something out of Ballard’s! And I love the knobs. I found those at Hobby Lobby. They have the best knobs. I almost didn’t want to take it over to my petite shop, but I can’t keep everything. esides Jenniferrizzo.com, your rss feed,e-mail or in your reader this is stolen content. Hi Jen what a beautiful cabinet is it now. Really great job you did. Enjoy it. Looking beautiful now Jen! I really like the color and the shade. I have been doing a lot of gray washing lately. Only I call it an “overcoat.” My customers love it! cute!! love the knob replacement….that made a big difference!! much more modern!! I am going to try this technique Jen! Your piece looks beautiful I bet it won’t in in your space for long! Great choice for the knobs too!Yes I agree Hobby lobby has a great selection! Love how your cabinet turned out! I’m sure it won’t last long in your shop. This looks really nice. How was your Midwestern blogger conference? I wasn’t able to attend, just wondered how it all went? I would love to go next year if you have another one! It’s wonderful how you updated this piece. 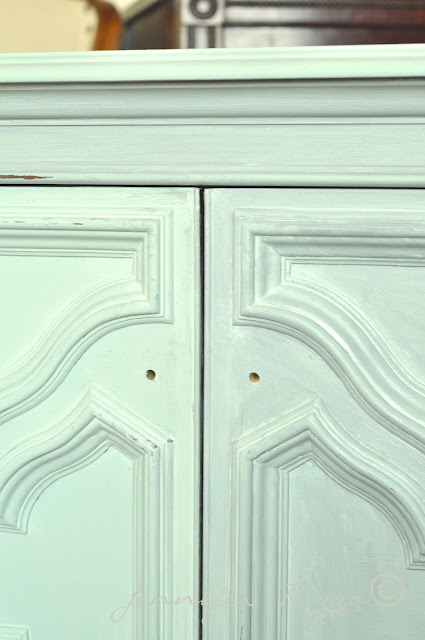 The color is so refreshing and I really like the way you changed out the knobs and moved them to a new location–so smart! Love it!! Such a pretty makeover! Beautiful, Jen! I love the color and the grey wash. The knob placement made a big different to its look, too. That’s a piece that would fit in great in a smaller home. I know it would work in our condo! Oh my gosh, so beautiful!! I love this piece! I wish I could visit your shop. I’m looking for something just like that for my foyer. Turned out very pretty Jennifer. I am luving the ‘new’ grey wash technique. Been playing with it myself. This turned out so lovely! 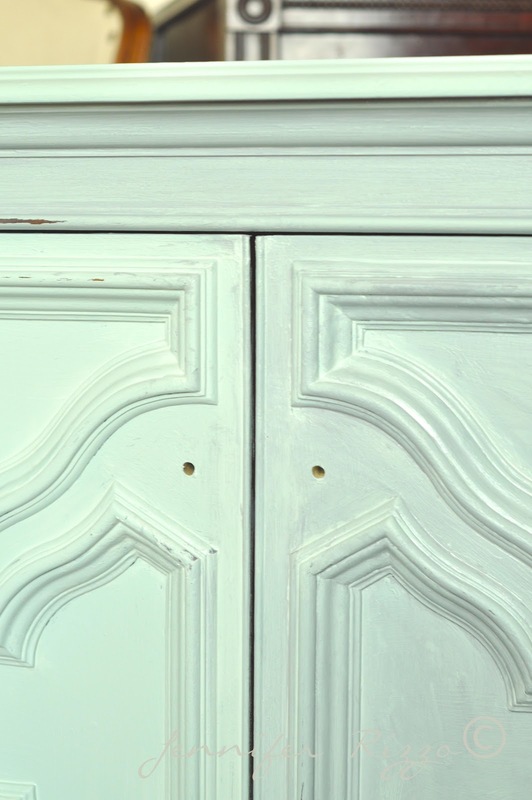 The color and the distressing are wonderful, as are the knobs. You did a beautiful job. A beautiful transformation. Oh la la so pretty it will sell quickly. Jen please come by my blog this week and join in on my first give away to celebrate my one year anniversary in blog land!!! 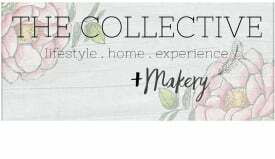 You have always been such a beautiful inspiration to me and I have loved so many of my treasures I have gotten from you so I want you to have a chance at the give away. Beautiful job! The knob replacement made a HUGE difference and updated it nicely. Thanks for the tips on grey washing. Beautiful transformation! Thanks for the tips! I’ve never tried grey washing but I will now! Have a great day!! What a before and after Jen!! I love the grey washing and will be trying that for sure. Need to see what kind of wax you use to seal too, thank you for all of the tips! 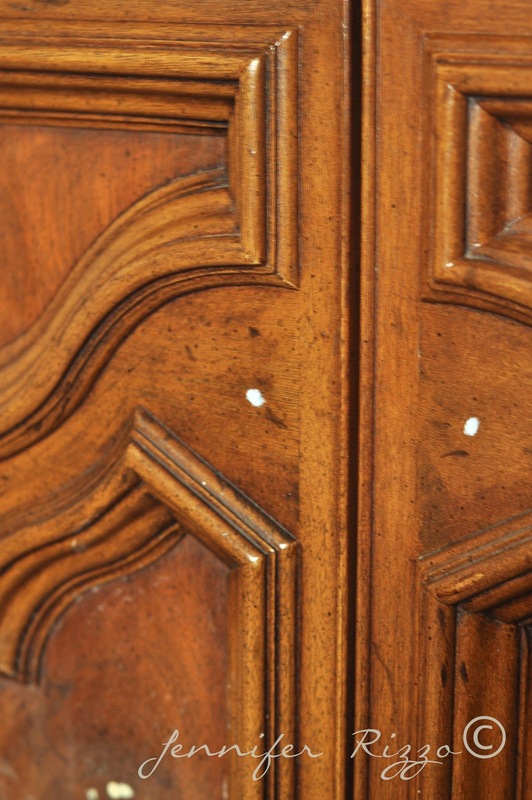 Wow, that is absolutely beautiful and you are right – Hobby Lobby DOES have the best knobs!! Great information. I’m wanting to try this technique on a few things. Loved your glazing/antiquing analogy! Great job! What a difference. I will pin this, my father-in-law has a buffet almost exactly like this. I may just have to get my hands on it. Thanks! You have just saved me a small fortune on my “new” bedroom set. My present Mediterranean BR set is over 20 years old, but still in the best condition and a keeper. But you are correct about it being a light thief. Now I am confident my plan to paint it is excellent idea. Your photos and written explanations are as excellent as the results of your fine work. Jen it looks amazing thanks for the easy tip! What sort of paint did you use for the main color? Was it a chalk or latex? Thanks! It was just flat latex. I actually prefer that to chalk paint.